US Ambassador to Israel says rest of the world can learn from the coexistence in Jerusalem. 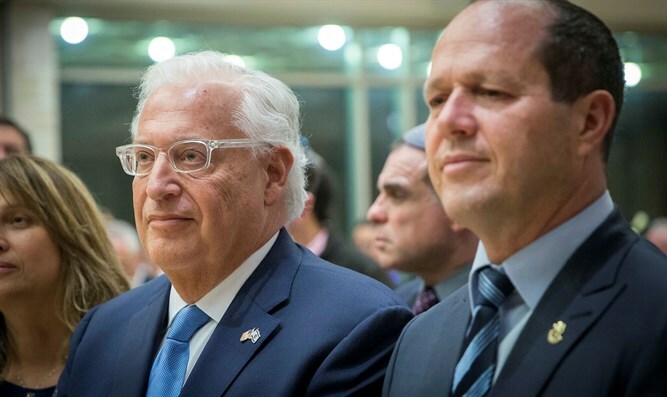 US Ambassador to Israel David Friedman took part Monday evening in a special event at the Menachem Begin Heritage Center to mark the 70th anniversary of the State of Israel, together with dozens of foreign ambassadors and diplomats. Friedmann took part in a panel discussion with the Ambassador of India in Israel and Israel's former ambassador to the United States, Sallai Meridor, and said that "Jerusalem is a model for the whole world for coexistence." Friedman noted that Jerusalem is holy to the three monotheistic religions. "There is the Western Wall, the Al-Aqsa Mosque and the Church of the Holy Sepulcher. Here there is no violence and here everyone can worship G-d. This is the example and the message to the world." "That's why the president chose to recognize Jerusalem as the capital of Israel," Friedman added, "I remember my parents crying in front of the television in '67, the result of which was that I celebrated my Bar Mitzvah at the Western Wall." Later, the ambassador said that he hopes that in the coming decade more Jews from the Diaspora will connect to their Jewish roots and to Israel. "I believe that relations between Israel and the United States will be strengthened as the United States is making a profit from relations with Israel." The Indian Ambassador to Israel, Pavan Kapoor, said that he was excited by the family Shabbat meal in Israel. "I saw it and said, 'This is like us. Today it is different, but the essence of the event is similar." Referring to the relations between Israel and India, the ambassador said, "Let more of my people come to Israel and learn ... We have a desire to receive more knowledge and to share it, and I am proud of the warm relations between our peoples."